Seven years ago was the first time I learned how to make sourdough starter from scratch. I was amazed at how easy it was! I’ve seen some sourdough starter recipes that have store bought yeast in the recipe, which seems like cheating to me. I love to make a sourdough starter the authentic way with just two ingredients: water and flour. It is like a magical science experiment in the kitchen. I get so giddy with excitement when my homemade sourdough starter starts to ferment and bubble! So are you ready to learn how to make your own sourdough starter from scratch with my easy recipe? Sourdough is made by a natural process of fermenting a water flour mixture with wild yeasts naturally occurring in the air. Sourdough makes a bread that is easier for our bodies to digest than regular flour breads. Don’t be scared off by the idea of fermenting and making sourdough, it is unbelievably easy! Making your own sourdough starter only takes a minute or two per day. I think the hardest part is remembering to feed your starter everyday! A number of years ago I wanted to make sourdough bread but I didn’t have any sourdough starter. I asked friends, looked on Craigslist and asked around at work. No one had any sourdough starter. I remembered my mom having starter when I was a kid and it was something you passed on to friends and neighbors, no one made it from scratch. I didn’t even know if that was possible so I hopped on the internet and began searching. Amazingly I did find a very simple recipe. I wrote the instructions on a piece of scratch paper that I still have. Unfortunately I didn’t write down the website I got the original sourdough starter recipe from so I can’t go back and thank them for helping me become a sourdough fanatic! I was recently reading Wild Fermentation by Sandor Ellix Katz, a book I highly recommend to those interested in learning more about fermenting foods. He explains in detail the process of fermentation, the history of sourdough plus recipes on making a variety of fermented foods. It is a fascinating read and if you aren’t already a fermenting fanatic, you will quickly become one! I’m sharing this easy sourdough starter recipe with you so you can start making your own fermented goodies and become a sourdough addict like myself. In the next few weeks I will be sharing some of our favorite sourdough recipes for you to try once you have a lovely bubbling sourdough starter ready to use. I have used both whole wheat and unrefined white flour to make sourdough starter (this is the flour I’ve used for years, GMO free and grown in Montana!). Sourdough can react with metals so it is best to use a glass jar, bowl or ceramic crock to store the sourdough starter. In a glass jar, bowl or crock, mix 2 Tablespoons of flour and 2 Tablespoons of lukewarm water. The consistency of the mixture should be more like thick pancake batter than a lump of bread dough. If you didn’t measure exactly and it is too dry, add just a tiny bit more water until the consistency is more wet. Cover the jar loosely with a breathable cover like cheesecloth (this kind works great) or a thin hand towel and let it sit on the counter at room temperature (it does best in 70-80 degree temps). Feed your starter once per day for the next seven days by adding the exact same measurement (2 TBS flour and 2 TBS water). You will notice that the mixture will start to develop bubbles and a nice sour smell after the first few days. 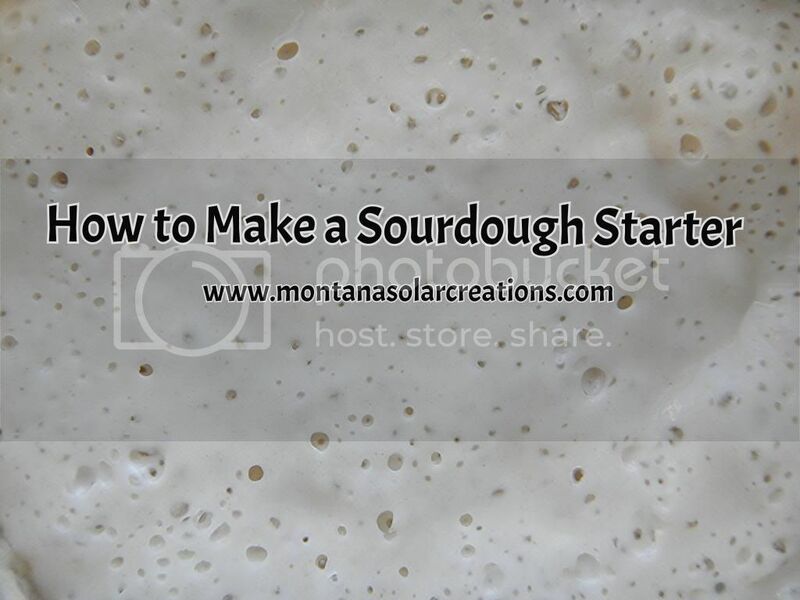 If the top of the sourdough starter begins to get a hard crust, simply pick it out and discard before feeding the starter again. If a brownish colored water separates out, stir it back in. After seven days your starter should be very bubbly and have a delicious sour smell. This is how you know it is ready to use. Each day you will need to feed your starter the same ratio of flour/water once per day or every other day to keep it alive. The beauty of sourdough is that you can make the starter in any quantity you want as long as you keep the 1:1 ratio of flour to water. TIP: If you are not going to be home everyday to feed your starter, you can put it in the refrigerator for a couple weeks without having to feed it every day. Just don’t make the mistake I did last year and forget about it or you will have a funky mess to discard and will have to make your sourdough starter from scratch again! Once you have a sourdough recipe you are going to use, make sure you know how much starter you will need and feed your starter accordingly. For example, if the recipe calls for 1/4 cup of starter you will need to feed your starter enough of the flour/water ratio to have 1/4 cup of starter plus extra to keep feeding for future use. I’ve never had any issues when making a sourdough starter from scratch but I’ve had a friend or two who struggled. Anytime I hear that someone is having issues with their sourdough starter, I always recommend this great resource Troubleshooting Sourdough Starter on the Cultures For Health website. If you’ve read this and feel like you can’t manage making your own sourdough starter, you might want to just buy one instead. You could check with local bakeries in your area that make and sell sourdough products to see if they will sell you some of their sourdough starter. You can check on local buy/sell groups in your area like local Facebook groups or Craigslist. Do you make your own sourdough starter from scratch? Share your tips in the comments below!